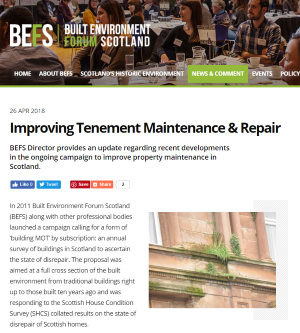 Built Environment Forum Scotland (BEFS), has summarised its take on debate on a motion in the Scottish Parliament generating consensus on the need for changes to legislation linked to the condition of Scotland’s tenement housing stock. The issue of tenement maintenance was progressed in a remarkably consensual Scottish Parliament debate yesterday, with agreement on a motion on the inadequacy of existing legislation in dealing with the condition of Scotland’s tenement housing stock. The motion gives further support to the cross party working group, chaired by Ben Macpherson MSP and secretariat provided by BEFS and the RICS (more information here), and it’s good to see the Minister for Local Government and Housing voting in favour of a review of the relevant legislation. The issue of tenement maintenance was recently presented at a meeting chaired by the Cabinet Secretary for Culture, Tourism and External Affairs who also advised not to shy away from looking at amending legislation. The parliamentary working group meets again next week to look at resourcing for local authorities to utilise powers, standard entity for owners to organise works and building inspections and BEFS hopes to make papers arising available shortly. Watch it on Parliament TV here.